When Frank O'Connor launched his candy chain a century ago, he saw its ideals embodied in the War of 1812 heroine. Advertisement, the Toronto Star, November 23, 1921. This year witnesses two significant anniversaries surrounding Laura Secord. June 23 marks the bicentennial of her legendary walk from Queenston to warn the British of a surprise American attack. October 20 marks the centennial of the opening of the first branch of the candy chain named in her honour. It’s hard to say if the combined celebrations will clear up or reinforce any misconceptions that the historical Secord was both a War of 1812 heroine and a crafty buttercream-filled Easter egg maker. When Frank O’Connor entered the candy business in 1913, the 28-year old entrepreneur wanted a name which would represent the clean, wholesome image he wanted his store to purvey. Who better than a beloved heroine whose exploits were drilled into several generations of schoolchildren and appealed to a growing sense of Canadian nationalism? Especially in a year when her name would have been in the news a lot due to the 100th anniversary of her legendary stroll. O’Connor’s decision to name his shop at 354 Yonge Street Laura Secord was, according to culinary historian Elizabeth Driver, “a stroke of marketing genius.” A chain quickly followed. 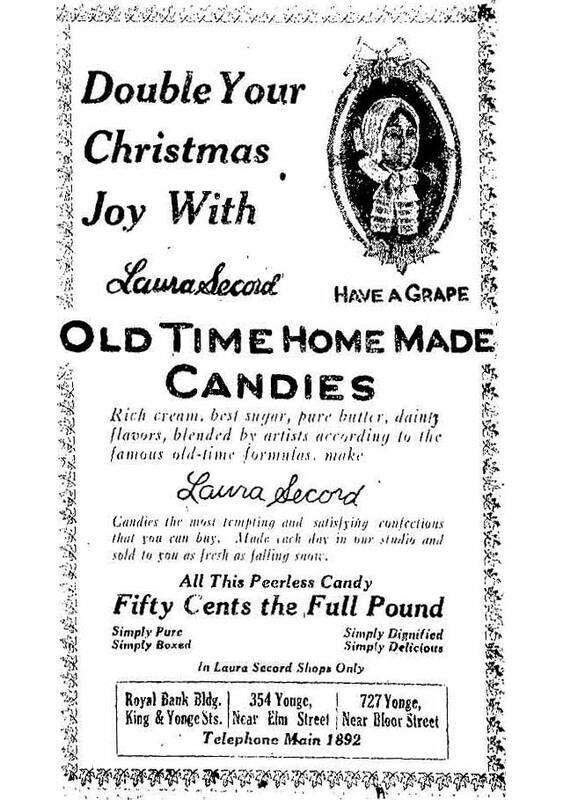 One of the earliest ads we found for Laura Secord, stressing its “old time home made candies.” The Toronto Star, December 21, 1915. Beyond the appeal of Secord’s name, O’Connor treated his products as the work of fine artisans. 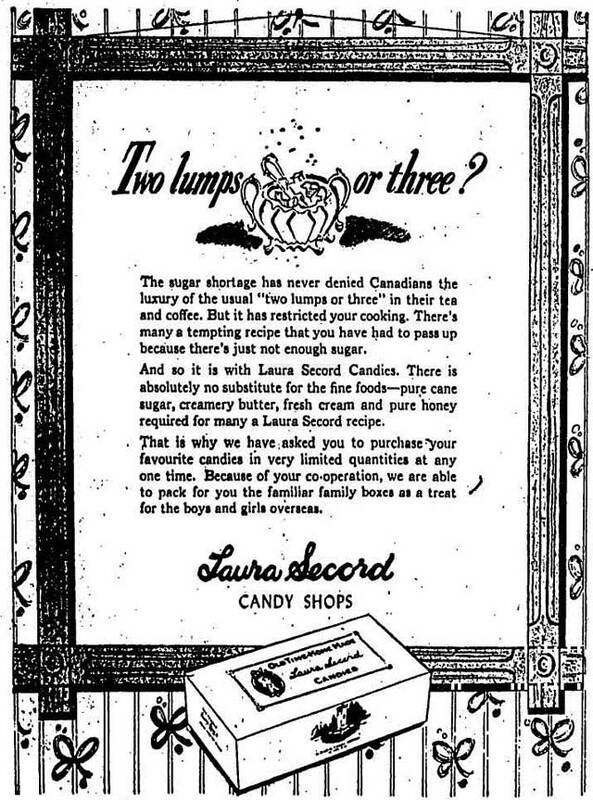 Advertising stressed the craftsmanship and quality of ingredients that went into Laura Secord candy. Production facilities were dubbed “studios.” Packaging was kept simple to reflect the purity of the product: a plain white box graced with a cameo of a middle-aged Secord. In January 1923, O’Connor presented employees with a surprise gift to mark the start of the company’s 10th anniversary year. “As far as I know,” O’Connor announced from his office at Laura Secord’s headquarters at Bathurst and Niagara streets, “we are the first candy concern in the world to share its profits with employees.” The anniversary was also marked with a historical essay contest open to all students aged 18 or younger across Ontario. Among the rules were a 500-word limit, use of only “historically accurate” facts, and a note that “neatness, originality and good composition will have first consideration.” The grand prize reflected the maternal image the company liked to project: either $200 in gold or “a fine chance for some bright Canadian youngster to treat his mother to a trip to New York.” Judged by a panel which included editors from all four Toronto daily newspapers, the prize went to 17-year-old Helen Cameron of Glencoe, who stressed Secord’s fulfillment of everyone’s desire to be heroic. When the prize announcement was made, two contestants were praised for the worthiness of their essays but publicly humiliated for exceeding the word limit. 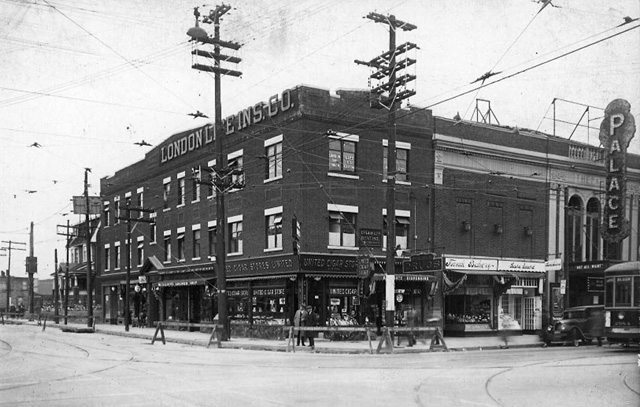 Northeast corner of Danforth and Pape Avenues, November 3, 1927. The store shown here opened in 1921. Photo by Alfred Pearson. City of Toronto Archives, Fonds 16, Series 71, Item 5484. 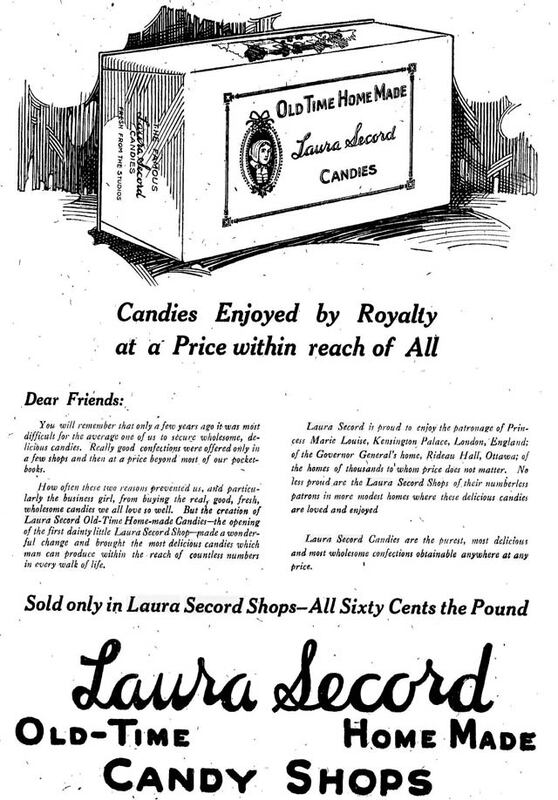 The company’s financial statement for 1926 showed that Laura Secord had grown into a 57-store chain stretching from Windsor to Quebec City. 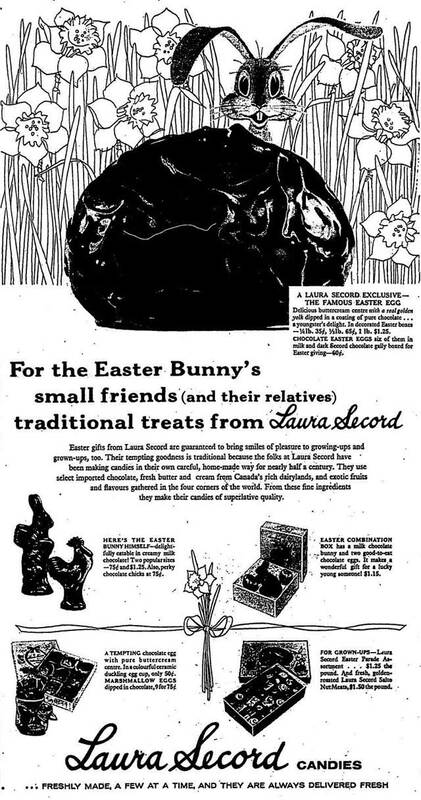 It observed that “the characteristics of the shops are: distinctive design; prominent locations; cleanliness; fresh merchandise of one quality, and sales at a fixed price for cash.” It was also claimed that Laura Secord had “never had an unprofitable year.” The statement didn’t touch upon the company’s American subsidiary, which was based in Rochester, New York. Since the name “Laura Secord” had little resonance for most Americans, O’Connor named the stores after cookbook author Fannie Farmer, though the spelling was changed to “Fanny Farmer” when the first shop opened in 1919. Candy made O’Connor a millionaire. Beginning in March 1928, he purchased 600 acres of land along Victoria Park Avenue (then known as the northern extension of Dawes Road) north of present-day Lawrence Avenue to build Maryvale. The property included a residence, horse stables, and a farm which was used for educational programs, plowing matches, and livestock judging. One of the routes which offered a convenient route between Maryvale and the city was soon named in his honour: O’Connor Drive. O’Connor used his money to become one of Toronto’s most generous philanthropists. A devout Catholic, O’Connor funded many educational institutions tied to his faith, including St. Michael’s College and De La Salle College. In 1935 he presented Archbishop James Charles McGuigan with a gift of $500,000 to be disbursed among various organizations, which included orphanages, the Canadian Institute for the Blind, Christie Street Veterans’ Hospital, the Hospital for Sick Children, and the Toronto Star Fresh Air Fund. He was named a Knight Commander of St. Gregory by Pope Pius XI in 1937. 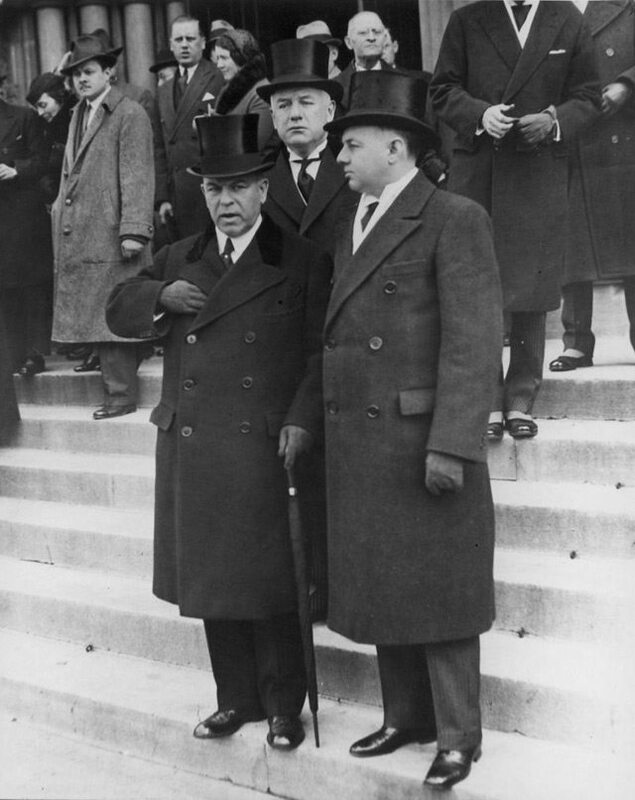 Prime Minister William Lyon Mackenzie King, Senator Frank O’Connor, and Premier of Ontario Mitchell Hepburn, 1930s. City of Toronto Archives, Fonds 1244, Item 8040. Politically, O’Connor was a key backroom operator in the provincial Liberal Party who helped elect Mitch Hepburn as Premier in 1934. He was among the business elite who partied at Hepburn’s suite in the King Edward Hotel. The reward for his work was a Senate appointment in 1935. During the last year of his life, O’Connor withdrew from Laura Secord, turning its presidency to his brother-in-law. After a long illness, O’Connor died at Maryvale on August 21, 1939. Many tributes were paid to his generous nature—former Conservative Prime Minister Arthur Meighen observed that “he seemed incapable of making an enemy.” O’Connor left his property to the Christian Brothers, who remained until 2000. Pieces were gradually sold off for uses ranging from residential neighbourhoods to a high school eventually named after O’Connor. A 21st-century battle to prevent the demolition of the remaining estate buildings by the Toronto Catholic District School Board led to renovations overseen by a non-profit organization. Despite the setback of a fire in May 2012, plans are moving ahead to open the first phases of O’Connor House as a multi-purpose community space later this year. A World War II advertisement addressing sugar supply issues. The Globe and Mail, July 6. 1944. Following the Second World War, the company’s depiction of its namesake changed. The romanticized depictions of Secord long featured in artwork and textbooks finally won. Out went the frumpy-looking matron in a bonnet; in came a younger, headwear-free attractive lady. “More-or-less authentic portraits of Loyalist goodwives do not sell candy,” writer Ken Lefolii noted in 1966. He felt the new image looked “like Miss Anywhere, the darling of half the advertisements in the Western world. Her face is as blank and smooth as a curtain-wall skyscraper, and like the new buildings that are lifting the faces of our cities, she has a look without a country.” Subsequent revamps of the corporate logo featured depictions of Secord further away from historical reality, matching instead the design trends of the time. Something new has happened to our town…and right in the Eglinton Subway if you please…We are talking about the opening of a quite different Laura Secord Shop…that has a new and very complete delicatessen service…and that has been the brilliant idea of people who know that most of us live our lives at a merry pace with no time for wasting in the kitchen…so what could be nicer than to pick up a complete and wonderfully good dinner as you wend your way home with nothing to do but set it forth…to collect a few delicacies to take along to your weekend hostess in the country…to plan an impromptu picnic and find everything right here but the basket…As the whole world knows before the name Laura Secord goes on…the finest quality can be taken for granted…and this shop is delightful proof of it…Shopping here can be fun too…for the décor is delightfully different…perky and fresh as the field flowers…and all this you will enjoy as you wander round picking up a roast chicken with savory dressing (but $1.59) choosing from the freshest salads…a wondrous array of cooked meats and moulds…going right along to the famous rolls…the breads…the cookies…pastries…and quite special cakes. 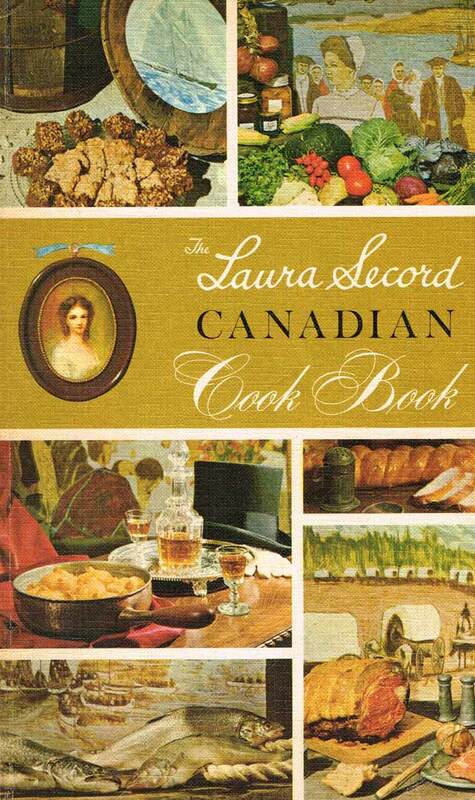 Cover of The Laura Secord Canadian Cook Book (Toronto: McClelland & Stewart, 1966). Looking for a project to celebrate Canada’s upcoming centennial, management entered into a partnership with the Canadian Home Economics Association to develop a cookbook whose recipes reflected the nation’s culinary history and diversity. A call went out for recipes, which were tested at Maple Leaf Mills in Toronto. The result, The Laura Secord Canadian Cook Book, became a kitchen staple across the nation when McClelland & Stewart published it in 1966. Given its namesake’s ties to the War of 1812, the book launch was held at Fort York. Soon after the cookbook hit the shelves, the company’s Canadian identity was thrown into crisis. Former American subsidiary Fanny Farmer acquired majority control in October 1967 following a bidding war with Salada Foods. A Star editorial joked that the historical Secord’s wartime role might be rewritten to depict her walking 20 miles through the woods to warn the American army of a British attack. Globe and Mail columnist Scott Young received a call from a reader appalled that nobody fought the takeover. “The heart of Laura’s story was that she outwitted the Yanks,” Young reflected, “and now we have let her down. It has nothing to do with chocolates at all. They are carrying off our heroine.” A few souls saw the move as further evidence Canada was destined to become the next state in the union. Those fears were short-lived. In June 1969, Labatt purchased Fanny Farmer’s stake in Laura Secord. The brewer added the candy maker to its growing portfolio of food brands like Catelli pasta and Habitant soup. Among the new owners’ first moves was to purchase the historic Secord’s home in Queenston, which underwent extensive renovations before reopening as a museum in 1972, complete with attached candy store. Candy production was moved from Bathurst Street to a new plant at 1500 Birchmount Road in Scarborough. Problems launching the new facility, combined with soaring ingredient prices, led to financial troubles during the mid-1970s. Advertisement, the Globe and Mail, April 2, 1958. Over the past 30 years, Laura Secord has changed hands many times, with owners ranging from multinational corporations (Nestlé) to American investment firms (Gordon Brothers). For a time, it was reunited yet again with Fanny Farmer. Among the casualties during these changes were the museum (assumed by the Niagara Parks Commission in 1998) and the Birchmount Road plant (shut in April 2009). Quebec-based company Nutriart restored the chain to Canadian ownership in February 2010, thus preventing any ardent nationalists from feeling too awkward should they choose to bring along Laura Secord products to any War of 1812 commemoration. Additional material from The Laura Secord Canadian Cook Book (Toronto: McClelland & Stewart, 1966; reprint edition North Vancouver: Whitecap, 2011); the June 1996 edition of the Financial Post Magazine; the September 22, 1923, November 17, 1923, and December 9, 1926 editions of the Globe; the August 22, 1939, August 19, 1964, December 8, 1966, and October 30, 1967 editions of the Globe and Mail; the June 3, 1999 and June 6, 2009 editions of the National Post; the August 21, 1939 edition of the Ottawa Citizen; and the January 16, 1923, August 21, 1939, August 22, 1939, October 19, 1960, November 11, 1966, October 30, 1967, and February 19, 2010 editions of the Toronto Star. Every Saturday, Historicist looks back at the events, places, and characters that have shaped Toronto into the city we know today.